How to tell if it's charging? How can I tell if my system is charging? It's 6V (front mount) with a genny, but the generator and voltage regulator are not Ford. The VR is Autolite (looks like model VRR-4008-A) and the genny is Delco-Remy (model 1101355). How can I tell if it's really charging or not? Quoting Removed, click Modern View to seeGlad you finally got it fixed. Process might have been shorter/quicker if you had told the half dozen 'helpers/guessers' that little bit of history, as in "after I re-wired the generator to VR, it stopped working'. Fewer hoops would have been jumped through. Always provide information of "what has changed or been done since it last worked"! The problem was caused by a broken terminal bushing. When I replaced the spark plug wires a couple weeks ago, I replaced the wires from the VR to the generator at the same time, as there was damage to one or two of them. 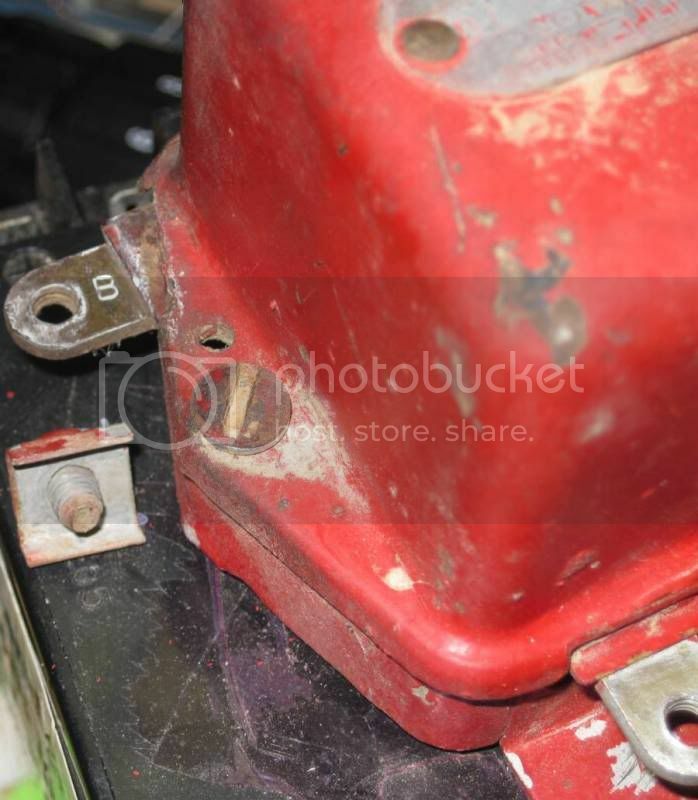 In doing so, I noticed that one of the terminals on the generator was rotating when I was trying to loosen/tighten the nut holding the wire on. Didn't think anything of it at the time. But when the terminal rotated, the wire connection to it on the inside broke off. 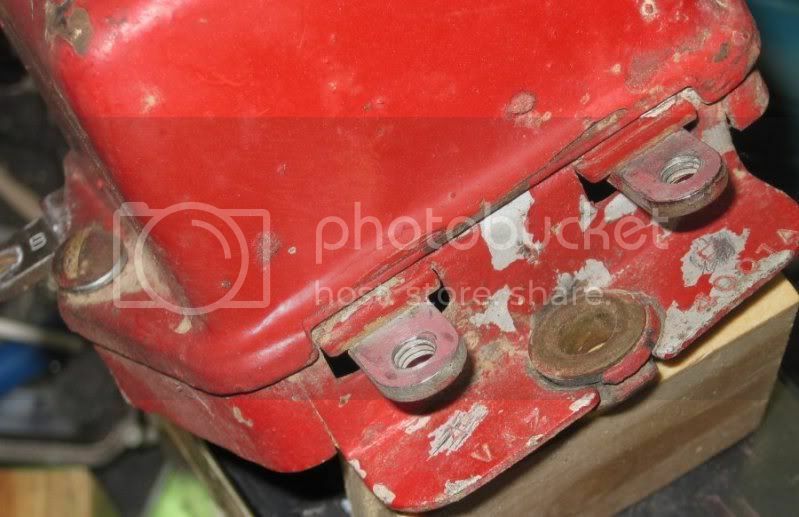 There was a Bakelite (or something like that) bushing holding the terminal from rotating and it cracked in two. I Krazy Glued it back together and soldered the wire back on. Put everything back together, and now the tractor is running (and charging) just fine. And the ammeter is actually working nicely. I'll take the tractor back to the cabin this weekend, and plow the snow off the drive! Paul, Electronics is not my strength (I am not sure what my strength is), but I just went through the process of testing the generator, polarizing, new ammeter and new voltage regulator. I knew my generator was working fine, but when I fired it up, the ammeter barely moved. All that work and no worky. Not happy. The problem was that there was no problem. I believe that if the battery is fully charged, the regulator throws away the juice coming from the generator because it doesn't need it and does not want to overcharge the battery. So the ammeter sees no difference. So what I did was turn on my headlights to drain (engine off) the battery. Started her back up and VOILA. The ammeter came to life. I may be wrong, but that is my theory. Quoting Removed, click Modern View to seePaul, that all adds up to not charging. You can jumper to polarize and after that doesn't make any difference, then you can try adding jumpers from Field to Ground and a second from BAT to ARM to connect generator to battery as well as provide maximum field current in generator, enabling it to produce its maximum output, assuming it is a working generator. If you can make it charge with the two jumpers in place, then it means generator OK, but VR bad. Be sure to remove BAT to ARM jumper when test ends/engine stops. 1. The ammeter is reading a small discharge when running (as I said above, I don't trust it until I can verify it, but that doesn't mean it's not right). 2. An analog voltmeter (the one on my battery load tester) reads the same voltage with it running as with it off. I actually watched it as I switched the engine off--the needle didn't even twitch off its reading of just over 6V. 3. When I press the load button on the load tester with the engine running, the needle drops the same amount as it does with the engine off. 4. My clamp-on ammeter, clamped over one of the big wires to the battery, reads around 1.5 amps when running, with the same direction as it reads when I'm cranking the starter (i.e. it's draining, not charging). I don't trust that thing to within 0.5 amps even when it's not affected by engine electrical noise (it's digital), but I should note that while its voltage reading is all over the map when the engine is running (hence the analog meter used in 2 &3 above), its clamp-on current reading is stable--it doesn't seem to have noise issues when measuring current with the clamp. Maybe not definite, but as close as I can get based on the advice posted earlier in this thread. Quoting Removed, click Modern View to seeSo, how did you determine that "its definitely not charging"? The VR number you gave isn't the same as this one, but terminals are the same. They are actually marked if you remove, clean, look closely. Momentarily jumper BAT to ARM. I guess the first step is to make sure the genny is polarized properly. I presume that applies to my Delco-Remy as much as the OEM genny. So how do I do that, given the VR and genny that I've got? I can't see any labels on the VR, so if anyone can tell me which two terminals (there are two on top, one at bottom left and one at bottom right) to jumper, I'd appreciate it. Quoting Removed, click Modern View to seeA simple to use & cheap ($2)hydrometer will show state of battery charge & while not giving real-time charging info, it will tell a person if the charging system is maintaining a charged battery or not & in the end that is all that matters. No technical knowledge required. Paul , this is the only way I know how to test if a battery or alternator generator , is actually charging . It is called a "battery load tester" , it not only tells the condition of your battery but also if it is charging . I don't know what is going on , I post pictures all the time , this time it didn't work. The ammeter on my 8N worked backwards after I converted to 12V with negative ground. I just reversed the wire and it works fine. At this point, I don't even know if there is a problem--I wanted to know how to tell if there was a problem. The analog voltmeter seems to be the consensus here. I'll try it and report back. Paul make sure your have the battery installed properly and like Old said. The six volt system on the 9N 2N is Positve Groumd the means the (+) gos to the tractor frame the Negitive (-) gos to the seloniod. 9$ tractor suply analog volt meter.. and a 10$ center 0 ammeter.. and you can tell if it's charging, how much current.. and what voltage. The meter works both ways--it reads positive if electrons are flowing in one direction and negative if they are flowing in the other. Assume that normally, the electrons flow from the terminal block to the ammeter and then to the solenoid, and that's a positive reading (I may have it backwards, but it doesn't matter for the sake of the argument). If it's wired so the wire goes through the loop left to right, the ammeter shows positive. If I rewire it so it goes through right to left, the ammeter "sees" the electrons moving the other way, and will read negative, even though the wire itself still has the electrons moving the same way. Do you have a clamp-on DC ammeter? (I do--very useful device!) If so, clamp it on a cable with DC current and take a reading. Then unclamp it, flip it over so it's facing the other way, reclamp it and take another reading--it will be negative if the first was positive. This is the same effect.
" The meter works both ways--it reads positive if electrons are flowing in one direction and negative if they are flowing in the other." Ahh yea, I know that. My point was you can not have it wired correctly w/ the correct polarity and have the wire "......going through the loop the wrong direction". I read what you wrote literally. It's impossible to have it connected at the starter switch & terminal block and then run it incorrectly through the loop on the ammeter. So, were all clear now! Dell, that assumes the ammeter is wired properly. If the wire is going through the loop the wrong direction, the gauge will read plus when it should be minus and vice versa. I want to verify that it is doing the right thing before I trust that gauge.
" If the wire is going through the loop the wrong direction, the gauge will read plus when it should be minus and vice versa. " It can't go in the wrong direction because the ends of the wire are still attached to the correct terminals. The wire goes from point A thru the loop on the ammeter to point B. How could that possibly read backwards? Pretty sure (I have 3 or 4 of em) that you can go thru the loop the wrong way. Maybe I'm having a CRS moment. 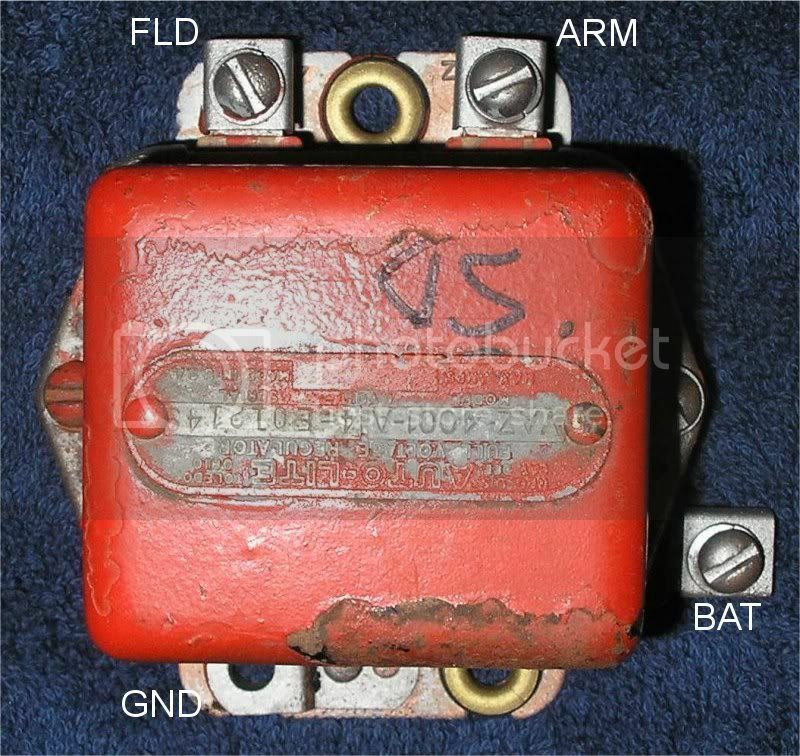 On an 8N, point A is the solenoid. Point B is the terminal block. The wire goes from the solenoid through the loop on the meter to the terminal block. Or, vice-versa.....doesn't matter. How can it go through the loop backwards? The current flows one way, the needle deflects one way, if the current reverses, the needle deflects the other way. Maybe I'm wrong but I know I've reversed it on a 9N. Well yea, if you reverse the current (as old said) it will read backwards. But if it's a loop meter & one end of the wire is on the terminal block & the other is on the solenoid, it's not 'reversible'! On a 9N.....it goes to the hot side of the starter switch, right? Sorry been away from the computer a couple of hours. It goes from the hot side of the starter switch thru the amp meter to the hot terminal on the resistor block. If you re wire it so it goes from right to left instead of left to right (thru the loop)it will be reversed. Check out tip # 47 (as others are saying). Or replace the ammeter on the tractor. Quoting Removed, click Modern View to seeNeed analog voltmeter, as digital does not like the electrically noisy environment. That VR number is factory original for early 8N tractors, but they did not use Delco-Remy generators but no reason that a D-R generator won't work.